Stand out on stage, online or in the boardroom. 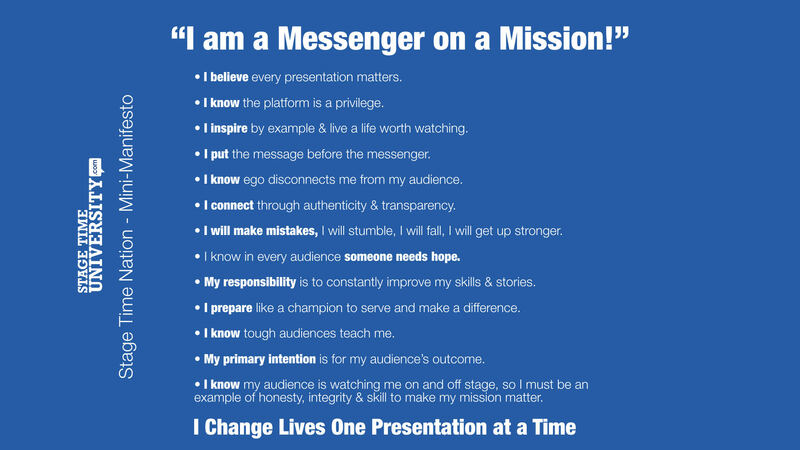 WANT MORE OUT OF EVERY SINGLE PRESENTATION YOU GIVE? Get insider secrets from the best speaker coaches in the world. Anyone can give a presentation. Few presentations are unforgettable. What is the difference between someone who takes the stage and someone who owns it? One word. Training. The best presenters have the best training from the best coaches. No one becomes great alone. Find all the answers in one place. Whether you want to master the skill or the business of speaking, Stage Time University is the one place. Quit passing business cards at networking events. When you are the one in front of the room, you are the expert. Be so good that people will network about the incredible insights they got from you. Now it’s a deeper conversation, and the selling is done for you. Position yourself as an expert in the industry by presenting and marketing like an unforgettable pro. Are You Making any of the Top 10 Speaking Mistakes? Click and find out, no charge!